Interview with University of Chicago professor and author of, Why Evolution is True, Dr. Jerry Coyne. Dr. Jerry Coyne: My interest in free will did not really grow out of evolution. It’s just something I’ve been interested in lately trying to ponder human behavior. Alex Tsakiris: Okay, but I think it is pretty important when we talk about what are the agencies of evolution. One of the articles that I sent you was on the research of Jeffrey Schwartz at UCLA. He studied Obsessive-compulsive disorder and found that self-directing thought could actually rewire their brain, something called neuroplasticity. This research fits into this broad category of research that shows that intention, mental thought, can actually change the physical. Doesn’t that have an impact on the overall picture of evolution? Dr. Jerry Coyne: I’d have to be convinced by reading this article that brains can change themselves without any external inputs from either the other parts of the body or the environment. Alex Tsakiris: But it sounds like you are open to the idea that that would be directly relevant to evolutionary theory? Dr. Jerry Coyne: No, I’m not. Again, I don’t understand why you keep trying to connect evolution with free will. Free will is, I believe, an illusion that we have that we can somehow affect the workings of our brain and free them from the laws of physics. My answer to that is no, we can’t arrange the subject of the laws of physics because they’re material entities. The feeling that we have free will, which of course we all have, we all have that feeling of agency. Whether or not that’s proactive evolution or whether it’s an epiphenomena or anything like that is something that I don’t know. None of us know the answer to that question. Welcome to Skeptiko, where we explore controversial science with leading researchers, thinkers, and their critics. I’m your host, Alex Tsakiris, and on this episode of Skeptiko we’re going to dig into evolutionary biology. I have to tell you, I’ve never been that interested in really exploring evolutionary biology. The reason is from the very beginning I saw the issues of consciousness being much more central to these core big picture science questions that we want to talk about. I mean, consciousness trumps evolution when we want to ask the questions of who are we really, where did we come from, what happens to us after we die? Consciousness more directly gets to those questions. The people who are on the cutting edge of consciousness research really, I think, have a lot more to say about these things. For example, when we look at former guests like Dr. Rupert Sheldrake and his Morphic Resonance theory, his idea that somehow there is a habit that’s formed in this field of consciousness that we have and it drives us in a certain direction. He has some pretty interesting experiments that he’s put together that establish that that may in fact be happening. When you look at what the impact of a theory like morphic resonance is on evolutionary biology, it kind of relegates evolutionary biology to a mere sideshow in this larger question of how did we come to be who we are? The same can be said for a lot of the guests that we’ve had on Skeptiko. Dean Radin, for example, and his presentiment work. What might it mean if our actions right now are somehow influenced by the future? And then there’s the larger question of mind equals brain. Are we just biological robots? Again, Atheists like Richard Dawkins and Jerry Coyne will tell you that you don’t have to look any further than evolutionary biology to answer those questions. But it just seems obvious to me that we want to ask those questions more directly and look at direct evidence, for example, the near-death experience science that we’ve looked at on this show. I think anyone would have to acknowledge that it certainly is more direct in getting to that question of whether or not our mind is something more than just this biological brain that we have. Today’s guest is one of the leading authorities on evolutionary genetics and speciation. Dr. Jerry Coyne is a professor at the University of Chicago. He’s published many popular as well as many scholarly articles on the Theory of Evolution, free will, science and religion, and Atheism. He’s also penned several popular science books including, Why Evolution is True. Dr. Coyne, welcome to Skeptiko. Thanks so much for joining me. Dr. Jerry Coyne: My pleasure. Alex Tsakiris: Jerry, can you start by telling us a little bit about your background and maybe how you became such a prominent figure in this culture war debate over evolution? Dr. Jerry Coyne: Well, I don’t know how prominent I am. My background is basically I had training in evolutionary genetics. I went to William & Mary in Virginia, undergraduate and started there while becoming excited about evolution through charismatic professors. Then Harvard for my Ph.D. and then post-doctoral training. A first job at the University of Maryland and now here. From my very first job, which I guess is 30 years ago this past December, I was required to teach Introductory Evolution and when you do that and you do a lot of reading about it you don’t even really have to teach about evolution to become aware that there’s huge resistance to accepting the scientific conception of evolution by the American public. Only about 40% of Americans accept evolution and only about 12% accept it in the way that we scientists do as a sort of purposeless unguided materialistic universe. You become aware of that pretty quickly. You find that some of your students are resistant to evolution because it contravenes from their notions about human specialness or about morality or about religion or whatever. When I lectured at Maryland there used to be a preacher that would stand in front of the door of the building and attack evolution. I used to go listen to him. I didn’t say anything to him but I slowly realized that if I want my field to be recognized by people as a valid form of scientific inquiry–and I don’t want that just because I want my own test driver. I think, as Dawkins repeatedly emphasized, understanding evolution makes you see the world in not only a very different way but a lot better and more fulfilling way. So if you want that to happen you sort of have to get involved in popularizing evolution and combatting the most common alternative to evolution which is the various forms of Creationism. So I guess I started talking about that in public and then I guess my real status as an opponent was a book I wrote called, Why Evolution is True. It came out three years ago. It’s not a very contentious book. It just lists in an non-confrontational way the reasons scientists accept the fact of evolution and going through all the various lines of evidence and stuff. That’s not really a controversial book. It’s no more controversial than a physics book would be, given the events for atoms or a medicine book would be giving the evidence that germs cause disease. But of course it’s a lightning rod for Creationists, somebody who wants to attack or try to debunk it. 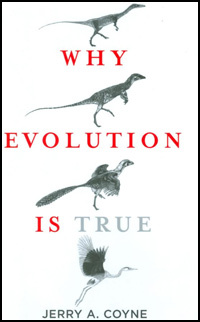 I also write a website which gives evidence for evolution with the same title as my book. I guess whatever prominence I have has come from these sorts of public outreach efforts which originally began to try to get Americans to change their minds about evolution being a lie or a conspiracy or whatever they think, the ones who oppose it. Alex Tsakiris: Well, there certainly is a lot of silliness out there in terms of the culture war debates and some of the arguments from people who come at it from a purely religious standpoint and have a hard time accepting evidence that contradicts their worldview. I think one of the angles I wanted to take in this show was also talking about how that cuts both ways sometimes. You mentioned Materialism and that is a cornerstone of a lot of these ideas. Materialism, as we’ve explored, isn’t on quite as solid of ground, especially lately, as it has been. Is there a valid concern about oversimplifying the case for Materialism, Reductionism, Determinism, all those –isms that really seem to be challenged by some of the newest and latest physics data out there? Dr. Jerry Coyne: On terms of Determinism maybe. It’s still a growing concern about whether certain quantum phenomena are determined to be in a certain way or whether they’re unpredictable. That’s a big debate in physics but about Materialism or Naturalism you say that those are being undercut. I don’t agree with that at all. So even the phenomena of quantum mechanics has been found out through reductionistic materialistic investigation by scientists, so I don’t see a problem with the basic foundations of science being—remember, science is an inherently Deterministic. Determinism is found not to apply at least from a physics and quantum level, so it doesn’t mean that we’re constrained to be complete Determinists although I think most macro-phenomenon are in terms of Materialism and Naturalism, yeah. Those are solid things. That’s the way we find out stuff in science. We’ve never found out anything by rejecting those approaches so I don’t know what you mean when you say they’ve been undercut. Alex Tsakiris: Okay, let me give you an example and make sure we’re talking about the same thing. I think one of the big nails in the coffin that a lot of people point to as being the beginning or the end of Materialism is a paper in no less than Nature, April ’07, titled “An Experimental Test for Non-Local Realism.” This paper has been cited over and over again as the final nail in the coffin of Materialism. Dr. Jerry Coyne: Well, I don’t know that paper so I can’t comment. But you’re talking about quantum mechanics again, in which there may be observer effects but as far as I know there’s still a lot of controversy about that. How that deals with the Theory of Evolution is completely mystifying to me. I don’t know why you bring up this paper. I mean, if you want to use that paper to attack evolution, go ahead. But there’s no connection as far as I can see. Dr. Jerry Coyne: Whoa, whoa, whoa! Who said the theory of random mutation has a new spin on it? I don’t think those authors did. Alex Tsakiris: Well, I think that’s exactly what they said. Dr. Jerry Coyne: No, you quote me from the paper where they say that. Not that you think that’s exactly what they’re saying. They’re talking about quantum mechanical effects. We have no idea whether those apply on the mutational level. And we have even less idea even if they did whether that would render mutation random or not. Dr. Jerry Coyne: I’m waiting to hear your quote about mutation from this paper. Dr. Jerry Coyne: No, you didn’t. You said that you think they say that. You read me the quote from the paper about non-local effects in physics which I’ll take your word that you’re reading the abstract. But when you say it applies to non-random mutation I want you to quote me where it says that in that paper. Dr. Jerry Coyne: So you’re making it up basically, right? Dr. Jerry Coyne: Well, you are. Yes, go ahead. Alex Tsakiris: I’m just saying if they’re saying at the fundamental level of physics non-local theories are incompatible with what we observe, then I think it calls into question the things that we’re talking about in terms of Materialism, Determinism. Isn’t that the direct implication of what they’re saying? Dr. Jerry Coyne: No! No, because they’re talking about what happens in a very, very tiny micro level. It does not mean that you can’t predict what happens when billiard table for which Newtonian mechanics is perfectly applicable. It’s as if you’re saying we can’t play billiards and we can’t shoot rockets to the moon because of this stuff that happens on a micro level. The fact is that assuming that these phenomena apply on most of the levels of reality that we deal with renders everything wrong is simply incorrect. For most macro phenomenon, Newtonian or classical mechanics works fine. For most micro-phenomenon you’re turning to quantum mechanics. It works fine. And in terms of evolution I don’t see how this quantum mechanics affects evolution at all. I mean, maybe it can affect mutation. You said that these people say that but that turned out to be something you made up. I don’t see how it can and even if it did it would not by any means render mutations non-random in the way that evolution has to mean that they’re random. Alex Tsakiris: Okay. I’ll get off the quantum theory stuff but I think if I really wanted to push it I’d go ahead and point out that quantum effects, particularly entanglement, have been shown in biological entities like little groups of neurons in two separate petri dishes so it’s not just at this super-micro level. But let’s move beyond quantum mechanics and quantum theory and talk about free will. I guess we should start by having you tell us why you think the issue of free will is central to the Theory of Evolution. Dr. Jerry Coyne: Oh, well, I don’t think it is. I don’t think I’ve ever said it is. Dr. Jerry Coyne: It’s not even important. I mean, my interest in free will did not really grow out of evolution. It’s just something I’ve been interested in lately trying to ponder human behavior. It’s not part of my evolution. The idea that we are free-acting agents may or may not be an evolved phenomenon. I don’t know. We know so little about how the brain works that I can’t say that but the only connection between free will and evolution that I can say is that like many phenomenon, like consciousness, again whose evolutionary origin or even brain causation are not understood, it maybe be a product of natural selection evolution or it may be an aberrant phenomenon. I don’t know the answer to that. Alex Tsakiris: Okay, but I think it is pretty important when we talk about what are the agencies of evolution. Doesn’t it come into play there when we talk about consciousness or when we talk about free will or we talk about whether our mind is separate from our brain or whether it’s totally the result of brain activity? Doesn’t that make a difference? Dr. Jerry Coyne: That’s not a result. That’s not evolutionary biology. That’s neurobiology. And in terms of agents of evolution I mean presumably you mean causes of evolution. Those causes are well defined. There’s natural selection and random processes like oceanic drift stuff. Those things are what produced our brains but how the direct connection between—I mean, free will is not an agency of evolution. It’s a product of evolution. If it is indeed a product of evolution, I’ve said I’m not sure it is. Alex Tsakiris: One of the articles that I sent you that I was hoping I could get you to comment on—I hope it isn’t too much of a stretch from this—but I think the research of Jeffrey Schwartz at UCLA is extremely relevant to this discussion. He’s a guy who studied OCD, obsessive-compulsive disorder in patients and he found that their self-directing thought could actually rewire their brain, something called neuroplasticity, and even the physical form of the brain. So it fits into this broad category of research that shows that intention, mental thought, can actually change the physical form that we experience, that we live. Doesn’t that have an impact on the overall picture of evolution? Dr. Jerry Coyne: Well, I don’t know this research. As I told you when we vetted my appearance here I’m not really qualified to answer questions about research that I’m not familiar with. So you’re asking me to say whether or not a piece of research I’m not familiar with justifies or not justifies free will. I haven’t read that so I can’t really comment on that, you know? Dr. Jerry Coyne: I’d have to be convinced by reading this article that brains can change themselves without any external inputs from either the other parts of the body or the environment. I’d have to see the article before I could comment on that. I haven’t. Alex Tsakiris: But Jerry, the reason I keep trying to connect these things back to evolution is because you’ve told me over and over again in our pre-interview and this that you want it to be connected to evolution. I don’t see that as a leap to say that this guy has done a study, a prominent researcher, and it shows exactly what you just said is important to the Theory of Evolution. That without any outside influence, thought itself can change the physical form and the function of the brain and that that would then put a new element into the equation that you haven’t accounted for. That to me seems central to the question. But you want to push back really hard and say no, it isn’t even hypothetically. Dr. Jerry Coyne: I didn’t say that. I said I was not familiar with that research. I find it doubtful that you can think yourself into changing your brain without any environmental influence, simply because people are not free from their environmental influences, either in the brain or outside the brain. You want me to agree with your preconceived notion of some kind of free will without my having looked at the papers that do that. And to connect that with evolution, I just don’t understand what connection you’re trying to get me to make. Even if we had free will, I’m not sure how much that affects evolution which after all is a theory that accounts for the evolution of millions and millions of species besides the ones that are supposed to have free will, i.e. humans and perhaps some primate relatives of ours. Alex Tsakiris: All right. Let me just move on. This is an area I don’t know if you want to go into, but the whole area of Alfred Russel Wallace. There’s been a lot of controversy, especially in the recent years, about Darwin’s role in developing the Theory of Evolution versus Alfred Russel Wallace. Do you have any thoughts on that you’d like to share? Dr. Jerry Coyne: Well, just the regular historical ones that Wallace and Darwin hit on the idea of natural selection at about the same time and Wallace communicated that to Darwin in 1858. Darwin was a bit perturbed that his thunder had been stolen because after all Darwin had been pondering this for over 20 years. They brokered a joint publication of their theories in the Biological Journal of the Linnean Society and while Wallace is sort of given credit as a co-discoverer of natural selection and of co-evolutionary chain, he isn’t as famous as Darwin because Darwin followed up that short paper with a big book, The Origin of the Species which really laid out the evidence of evolution in great detail. He had a lot of supporting natural history, a lot of thought, so Wallace although he later wrote a book called, Darwinism, curiously enough, Wallace gets credit as being the sort of second character in the history of evolution. But his researches don’t justify being placed in the pantheon nearly as high as Darwin. Dr. Jerry Coyne: Well, it’s certainly true. You certainly are aware that Darwin is much more famous than Wallace. So to say you don’t know about that, I don’t know what that means. Any scientist is going to tell you that Darwin is the man and Wallace is sort of a second thought who had a good idea but didn’t follow it up. Alex Tsakiris: All right, we’re kind of mixing things together there in terms of who’s more famous versus whose ideas were better or better fit the data. Dr. Jerry Coyne: Well, Darwin was correct in both of those so it doesn’t matter which one of those characterizations you give. Now that’s pretty harsh but what about this issue of Alfred Russel Wallace and biogeography? Did you nail it in your book or did you maybe slight Wallace a little bit by giving Darwin credit when it’s pretty well understood that Wallace is acknowledged as the Father of Biogeography? Dr. Jerry Coyne: Well, there’s a difference. First of all, the guy you describe as a Wallace scholar, he’s an Intelligent Design Creationist. He publishes at the Discovery Institute website. He’s not described there as a Wallace scholar. He’s described as a historian of science who has written a book about Wallace, so okay, let’s just get that straight. My book is about using biogeography as evidence for evolution. Remember, the title of my book is Why Evolution is True so yeah, Wallace could be regarded as the Father of Biogeography in terms of describing the geographical distributions of plants and animals. That’s what he did. A lot of his research was used by Darwin but Wallace never made an argument until much after Darwin did that biogeography itself is evidence for evolution. So when I’m giving the evidence for evolution based on the distribution of plants and animals, that all came from Darwin. None of that came from Wallace. I mean, some of the data came from Wallace but to synthesize that into a coherent argument in favor of evolution based on the geographic distribution of plants and animals, that was completely Darwin’s achievement. Wallace didn’t do that so to say I gave Wallace short shrift is kind of erroneous. Wallace did not use biogeography as evidence of evolution. I mean, never. He wrote a very short paper and it was about natural selection, not biogeography. Darwin followed that up in a book in 1859 which had two chapters on biogeography as evidence for evolution. Wallace didn’t do that. So no, I haven’t slighted Wallace in the reason I wrote the book which is to show that you can use biogeography as evidence for evolution. So yeah, if that’s the charge, I haven’t read this article except to click on it because you sent it to me a short while back and I didn’t have time to read it. I would not accept the charge that I slighted Wallace. Dr. Jerry Coyne: Well, you defend it. Why don’t you defend that to me then since you’ve read this apparently. I haven’t. Tell me how Wallace deduced biogeography as evidence for evolution. This is the point I was trying to make. Where is Wallace’s work on that? Alex Tsakiris: I think I can do that, Jerry, but all I’d be doing would be reading Michael Flannery’s article that we can point anyone else to read and they can sort out exactly your quote and exactly the quotes of Wallace that were made and the many other experts in the field who have referenced Wallace as being the pre-eminent thinker in this area. Dr. Jerry Coyne: You are—I’m sorry but you are wrong there. Wallace is not the pre-eminent thinker in the biogeographic evidence for evolution. Name me some experts who think that Wallace is more important than Darwin in using biogeography to support evolution. You keep making these statements. People think there are people like that and when I ask you for evidence for them you can’t produce any. I can give you any number of names of people that think Darwin was far more important than Wallace using biogeography as evidence of evolution. The article you’re pointing out doesn’t even say that. What it does is say that Wallace thought—and this is based on my quick scan of the article—that the human mind just couldn’t be the product of natural selection, which is something that is well-known in the field. He thought humans were exempt in one respect from his own theories which is the human mind, but it doesn’t say anything about Wallace being better than Darwin and proving evolution by biogeography. So you’re mischaracterizing even this article which again, appears on a Creationist website. Alex Tsakiris: Okay, then hold on and I’ll read you exactly—I’ll read into the podcast exactly what he says, okay? So let me get to that part. Dr. Jerry Coyne: Okay, again that’s completely irrelevant. So yeah, Wallace is regarded—you notice I agree with you that Wallace is the Father of Biogeography. What I cited Darwin for and you notice the book he published was in 1859, which is 17 years before Wallace’s book, which used biogeography as the evidence for evolution. He preceded Wallace in doing that. Darwin was the person that convinced the world of this. Wallace basically used Darwin’s ideas in his later book as evidence to explain biogeography. Darwin was not about biogeography. He was a synthesizer; he was a thinker. He did not travel the world except in the Beagle the way Wallace did to describe this. So they’re completely different endeavors. Darwin was using biogeography as a small part of a larger synthesis to show the evidence for evolution. Wallace was much more interested in documenting as in the Wallace’s line, the geographic distribution of plants and animals, which can be used as evidence for evolution but was used a lot more by Darwin than by Wallace. So I don’t see in what sense this is an attack on me at all. My book is about the use of biogeography as one of the many kinds of evidence that can be used to prove evolution and the person that’s responsible for bringing that to public consciousness is not Alfred Russel Wallace but Charles Darwin in 1859. So it’s just a false and scurrilous charge to accuse me of that, you know? Dr. Jerry Coyne: I reject it. Alex Tsakiris: Okay, that’s fine. But you asked me to bring you forth the evidence. Dr. Jerry Coyne: Yeah, but what evidence you gave me was that Wallace is the Father of Biogeography. I agree with that. Alex Tsakiris: Okay, well, let me make the connection. Dr. Jerry Coyne: That doesn’t take issue with anything that I said in my book. Alex Tsakiris: Well, he does. He does because here again I’ll read from Flannery. Well, when you connect those with the fact that now what you’re saying is really Wallace is the Father of Biogeography, I think he has a point about it not being totally clear in your writing there. Dr. Jerry Coyne: Oh, this is really a tempest in a teapot. Darwin was the first person to bring to public consciousness the fact that biogeography can be profound evidence for evolution. And yeah, we consider The Origin of Species the founding document because it has two chapters about biogeography and Wallace’s book was not written until 1876 which is 17 years later. Wallace is considered the Father of Biogeography because he wrote huge books on it and Darwin wrote two chapters on it. So yeah, Wallace was much more interested in that topic than Darwin. But so what? My book is about the evidence for evolution. To say that Wallace did a lot more than Darwin did in biogeography, that doesn’t contradict anything I said in the book. Where was I wrong? You tell me where I was wrong. Alex Tsakiris: It wasn’t a major point that I was going to make. You kind of drew me into it by accusing me of not having any evidence or any research for it. The point, of course, is the point that a lot of people make. Alfred Russel Wallace isn’t given due credit because his views sound much more like–in this culture war debate–like the Intelligent Design folks. Dr. Jerry Coyne: No, he’s not given due credit not for that reason even though that is an aberrancy that does detract from his scientific accomplishments somewhat. He’s not given due credit for the Theory of Evolution because he published only one small paper on it in 1858. Darwin did, too, but then Darwin followed it up in the next year with Origin of Species. Wallace didn’t do anything like it. Darwin’s book was out ten years before Wallace published anything on this topic. It changed the mind of many thinking people from the Creationist myths that had preceded him towards evolution. Wallace didn’t do that. He simply does not get the credit. They had an idea, and again it’s dubious whether Wallace’s view of natural selection really is the same thing as what Darwin thought of natural selection. I have my own doubts about that. But there can be no doubt that Darwin gets the credit because he worked out the implications of his theory in this huge 450-page book and introduced all the evidence from nature, not only from biogeography but from the fossil records, from the existence of vestigial organs, from development of photosynthesis and artificial selection into this massive and convincing tome for the existence of evolution referencing common ancestry and the workings of natural selection. Wallace didn’t do anything like that. He wrote like a two-page paper in 1858. So the claim that he should get as much credit as Darwin, much less more credit than Darwin, is simply fatuous. It really is. Darwin gets credit for having worked out the theory in its full implications in great detail. That’s why he’s more famous than Wallace. Wallace is justifiably famous for his work on biogeography. He’s justifiably discredited for his view that the human brain can’t be a product of natural selection simply because he thought it was too complicated. I guess he thought it was a product of divine intercession. Most people don’t even know that Wallace said that. They just think Wallace ran second because he didn’t do as good a job as Darwin at pushing his theories and convincing people by writing big books about them. Alex Tsakiris: I think you’d get a lot of argument from Darwin and Wallace scholars on some of that, but leaving some of that aside, how much does it matter? I mean, Jerry, you went on and on there. I let you talk for four minutes and you’d go from one statement/proclamation to another and then I’d just say, “Gee, maybe not everyone thinks like you do,” and you immediately want to push back. Let me at least get the question out and that is how much does it matter, Jerry? How much does it matter, the actual historical record of the intellectual ideas of these two men? Do you think it matters? I think it matters but do you think it matters? Dr. Jerry Coyne: Well, in terms of the progress of science I don’t know. But you’re the one that was emphasizing the fact that Wallace doesn’t get enough credit so you clearly think it matters. If you’re trying to apportion who gets what, if you’re interested in the history of science or you want to read this book that really changed public consciousness about humans in either a philosophical scientific or historical way, yeah, it matters. You would read Darwin’s book and not Wallace’s book. But I just think we have to take issue with the fact that you keep claiming without citing anybody except this one Intelligent Design Creationist guy that lots of scholars would disagree with me. Yeah, that’s push back because I’m asking you to name them and I have a feeling you can’t name them. I can name the people that will support Darwin’s pre-eminence. Alex Tsakiris: Okay, we’ll do a good follow-up and you give me plenty of ammunition to feed up to. There’s a lot of question as to really whose idea was first and the publication of those ideas. But there’s a lot more controversy here than you’re letting on to. Just because you can cite people that side with your view of history, that doesn’t necessarily mean that it’s more accurate. I think the other thing I take out of the whole Darwin versus Wallace debate, which to me you’re the evolutionary expert so you can tell me, but their understanding of competition seems to be very different. The Darwinian model of—for lack of a better term—survival of the fittest really wins out when in retrospect Wallace’s view of the competition being among groups seems to be much more fitting with evidence that’s come forth since then. And from a social perspective what’s happened with Neo-Darwinism in terms of this idea of survival of the fittest has certainly had some unintended negative consequences that one would have to wonder where we’d be if we saw evolution as more of a survival of the group idea the way that Wallace perceived it. Alex Tsakiris: It’s not clear whether Wallace believed in group selection? Dr. Jerry Coyne: In the way that we conceive of group selection today. If you read his 1858 paper you’ll see that he describes natural selection in a way that it’s ambiguous whether he thought of it as the succession of one group or another or of individuals between groups. It really is ambiguous. When I have my students read the paper every year they always notice that it’s not clear about whether Darwin and Wallace conceived natural selection the same way. Regardless, though, the historical result is that we now realize that Darwin was right. There’s very, very little evidence for group selection, selection among groups as being responsible for adaptations. In fact, it’s very hard to think of any traits in organisms that have evolved via group selection versus the sort of Darwinian kind of individual selection. It’s characterized as survival of the fittest but of course Darwin realized, as we do today, that it’s not just survival. Alex Tsakiris: Right. But that’s the connection I was making but I like how you constantly rephrase what I’m saying and tell me how I’m wrong. I just don’t know where all that antagonism comes. I certainly haven’t tried to generate it on my side. I’m telling you what has become the popular notion of survival of the fittest. If you want to talk about survival of the fitter, I think that’s fine. Dr. Jerry Coyne: Wait a minute, Alex. You told me that group selection was seen as the going concern the way selection works. You don’t know what you’re talking about when you say that because it’s not true that group selection is accepted by biologists or even the general public as the way natural selection works. Alex Tsakiris: I didn’t say group selection, Jerry. I never said group selection. I’m not familiar with those phrases. You’re the evolution expert. What I’m telling you from what my guests have told me, and you can tell me Mike Flannery is wrong or he’s read the history wrong. But his point was that Wallace tended to view competition occurring among groups in a demographic sense. And I think what he’s saying is that what the competition was not to have just the alpha male have his genes go forward but for the whole group to have—the competition is not to be the best but just not to be the worst. So competition for the survival of the fitter. Dr. Jerry Coyne: It’s the same thing. It’s a comparative thing. The better genes win out. The better the gene is at reproducing itself, the more it reproduces in the population. The worse they are, the worse they do and they get eliminated. I’m not clear what you’re trying to say except yeah, maybe Wallace did have a view on group selection but it hasn’t survived the test of time and biologists don’t accept that as being very important in evolution anymore. Dr. Jerry Coyne: Yeah, because I’m not a physicist. I’m a biologist. Dr. Jerry Coyne: Well, Alex, talk about being antagonistic, you need to go back and read a little bit of biology because respectfully you don’t know what you’re talking about when you talk about group selection. Alex Tsakiris: I’m just a host of a humble little podcast. You’re the expert. Dr. Jerry Coyne: I’m not an expert on physics. I have not read that paper. Alex Tsakiris: You’re far from an expert on physics. Dr. Jerry Coyne: I haven’t read that paper so I can’t comment. You want me to just sort of implicitly agree with what it says to somehow buttress what your views are and I can’t do that. I can’t agree with a paper unless I’ve seen that paper. Alex Tsakiris: That’s ridiculous. That’s ridiculous. We’ll let people go back and listen to it. I didn’t make anything up about Nature 446. Dr. Jerry Coyne: Sorry, nobody’s pushed me. I know enough about physics to be able to say that we don’t have free will in the Libertarian sense. Yeah, I do. I am not deeply familiar with quantum mechanics. You cited a technical paper on quantum mechanics in Nature that I haven’t read. I’m sorry that I’m a biologist. Dr. Jerry Coyne: I didn’t say I didn’t want to go there. I said you sent me this stuff about a half an hour ago and I was doing something else. Alex Tsakiris: You wrote about it in your blog. Dr. Jerry Coyne: That was over a year ago and I’d have to go back and look at the post. If you’d told me this several days ago I would have done it. You tell me this about half an hour ago when I was writing an article and I’m sorry I didn’t have time to go back and read it. Just refer readers to the post and they can go see what I said about it. That’s the way I felt about it at the time. Alex Tsakiris: Hey, that’s fair enough, Jerry. I sent it to you well over two hours ago but your point is still well-taken, okay? The only reason I did that is I think you have an obligation to know stuff in that area and particularly stuff that you’ve posted on a year ago. So I’ll just stand by that. As far as whether I sent it to you a half hour or two hours ago doesn’t make any difference. Dr. Jerry Coyne: Well, I do know this stuff. Refer the readers to that piece and they can go back and see what I said about it. I’m a scientist. I cannot be pushed to make statements about stuff that I have not looked at in the past day or so. I just can’t. Dr. Jerry Coyne: And I cannot read every paper on quantum mechanics. You surely haven’t yourself to ask me enough questions about whether this has any effect on evolution or not. Alex Tsakiris: Not at all because it’s so basic and fundamental I don’t have to go there. Dr. Jerry Coyne: What does that have to do with evolution? Alex Tsakiris: It has to do with evolution because what we find is that it’s consciousness. If we put our consciousness one way or another it measures this way or that way. We no longer have laws of physics the way that you talk about them in this high school science way in your USA Today articles. Dr. Jerry Coyne: Okay, talk about it being antagonistic. A high school science way is an antagonistic statement. Dr. Jerry Coyne: You said I talk about it in a high school science way in my USA Today article. Dr. Jerry Coyne: What you may not be aware is in the first draft of that article I wrote about the effect of quantum mechanics and Determinism on free will and the editor took out that part because he said it was too long and it would be too boring for people. So I’m not responsible for that. My view is that quantum mechanics doesn’t really affect my view that we don’t have free will because it’s really a random effect on behavior and not anything we can consciously control. But I did write about that and they took it out because it was too long. I did consider it. So if it’s a high school way, it’s a high school way because of the editor, not because of me. Dr. Jerry Coyne: I’m not aware that it’s been demonstrated in biological entities. You have to tell me what you see as the implications for evolutionary biology. Are you saying that birds didn’t evolve from dinosaurs because of quantum entanglement? Is that what you’re telling me? Alex Tsakiris: No, I’m not. Dr. Jerry Coyne: What part of the Theory of Evolution is invalidated by this quantum physics? I don’t understand. Even mutation itself, which may although I don’t think people have settled on that, mutations may involve quantum phenomenon but even so that wouldn’t initiate the fact that they are random in the sense that biologists mean random. And if mutations are still random regardless of their cause, whether it’s Deterministic or probabilistic then Darwinian evolution proceeds the way we always thought it would. So I don’t see these deep implications for evolutional biology in quantum physics. I just don’t. Dr. Jerry Coyne: And we don’t talk about that in evolutionary biology because nobody thinks it’s important right now. Until somebody shows how it can be then we won’t worry about it. Alex Tsakiris: Okay, okay. Again, if you want me to answer that question, I will. Or we can skip past it. If that’s a real question, I think whenever we have a broader understanding about the forces that come into play here in terms of what could possibly be the guiding, controlling forces in this process, whether it’s blind or whether it’s random, when we throw in a new equation we say, “Hey, the presentiment work of Darryl Bem and Dean Radin suggests that somehow, in some way we don’t understand, we may be receiving information from the future.” well, that kind of calls into question the theory. Or if we say, “Information is arising from another means other than purely a biological function of the brain,” I think that calls into question this idea of intention and guidance. But it sounds like you keep characterizing that as just totally outside the realm of anything we would even consider in the theory of biology. Or then you want to cast me in some kind of Creationist light and say that I somehow don’t think that dinosaurs didn’t predate birds or whatever you said. I didn’t go there. I just said, “Doesn’t it broaden the discussion?” Isn’t that an area that we have to examine? Couldn’t it potentially undermine the theory of Neo-Darwinism as we currently understand it? Dr. Jerry Coyne: I don’t see how it could. Alex Tsakiris: Fair enough. You don’t see how it could. Dr. Jerry Coyne: Yeah, I don’t. And I really don’t understand what you’re getting at. Yeah, sure, Elvis could exist under dandelions and they could affect the Theory of Evolution, too. You show me the evidence first that this stuff operates in a convincing way and a potential connection to evolution and I’ll consider that. But until you have evidence, and remember, this precognition study that you’re citing is one study which is controversial as far as I know. Alex Tsakiris: But you’re not going to comment on it because you don’t know anything about it and you haven’t written about it. Dr. Jerry Coyne: I read it. I told you, I posted it on my website. Alex Tsakiris: But now you’re commenting on it, Jerry. Then let’s comment on Dean Radin’s work that’s been replicated 27 times in 9 different labs around the world that say the same thing. Dr. Jerry Coyne: You know what? This interview is very frustrating for me because you really don’t want to get my views on stuff. You want to impose your views on me and get me to agree with them. Alex Tsakiris: You haven’t had a chance? You’re saying you haven’t had a chance to express your views. Dr. Jerry Coyne: No, I’m saying that you’re asking me do I not or do I agree with this. You read me papers that I either haven’t looked at in a long time or haven’t ever read like that physics paper and say, “Well, don’t you think that this really causes problems for Darwinism?” How am I supposed to answer that if I haven’t read that paper? Alex Tsakiris: You are supposed to answer that. Dr. Jerry Coyne: And then your accusation is well, Dr. Coyne has an evolutionary bias. He should have read every paper on quantum mechanics that’s come out in the past 50 years. Alex Tsakiris: Tell us a little bit real quickly in the time we have left what’s coming up for you. Do you have any new books coming out or in the works or any appearances that people should know about? Dr. Jerry Coyne: Well, just the usual seminars I’ll be giving which won’t be of interest to a general audience. I’m working on a new book now that I prefer not to talk about because it hasn’t really gelled yet. That will be a matter of three years or so, so stay tuned. If people want to read about my take on the precognition paper they can go to my website and Google that and see what I thought about it at the time. I don’t see why I should be chastised because I don’t remember it now. If you want me to discuss something you need to talk about it way in advance and give me time. Usually when I’m asked to comment on a paper for a scientific journal, they’ll send it to me two or three days in advance, not the same day. Alex Tsakiris: No more chastising on my part. Jerry, again, thanks so much for being on the show today. Dr. Jerry Coyne: All right, my pleasure. I want to thank my guest, Jerry Coyne, for joining me today on Skeptiko. On this show we’ve explored these topics of consciousness with guests that have a wide range of spiritual beliefs. But as I’ve told you, it’s always most difficult for me to talk to folks with Fundamentalist beliefs because when you talk to, for example, a Fundamentalist Christian even though you can have a nice discussion and have a good intellectual discussion around debates, you always have this thought in the back of your head that this is somehow going to lead around to Jesus and the Bible and the resurrection because that’s the doctrine. That’s the dogma. And from that what you wind up with is not an open-ended real inquiry but rather an elaborate set of apologetics; carefully constructed arguments to make a certain point, to always lead you back to your starting place if you’re a Fundamentalist. I’ve found, as I’ve often said on this show, that that’s equally true for Fundamentalist Atheists. It’s certainly true for folks like Jerry Coyne, whose arguments are fundamentally Atheist arguments. He’s isn’t really arguing things from a scientific perspective. He’s arguing really from what I’d have to call a religious perspective. A dogmatic set of beliefs that build like a house of cards to a conclusion that must always be true. In this case, that conclusion of course is the Theory of Evolution, which if you’re an Atheist not only explains the speciation of life but really explains everything about who we are, where we came from, where we’re going, and of course explains everything about these issues of consciousness, mind, and brain. I don’t really think the theory can carry all that weight. All I guess we can do here in wrapping up this show is go back and look at Jerry’s statements and put them in the light of day and see if they really hold up. Now that’s going to be hard to do on some points because he claims ignorance. He claims ignorance about neuroplasticity; he claims ignorance about psi and about presentiment work. He even claims ignorance about basic quantum theory of entanglement and the Observer Effect. I can’t imagine what would happen if I pushed him on near-death experience science. You know, I’ve found that a lot of skeptics—one of their big push-backs to this show is that guests aren’t properly given the opportunity to review the research. I find that such a shallow excuse. I mean, if you’re really a broad thinker in this area, shouldn’t you be aware of some of the basic questions surrounding consciousness? Surrounding mind equals brain? Should we really allow people to retreat to the “I don’t know. I haven’t read that,” kind of excuse? Especially when we’re talking about basic stuff about quantum entanglement and how that might affect consciousness. I think most people are tuned into at least the debate there. So while those issues might be hard to pin down Jerry on, I would encourage you to go and Google “quantum entanglement in biological systems.” You’ll find just thousands and thousands of links to dozens and dozens of papers that suggest what you probably already knew, and that’s that quantum entanglement is being found in larger and larger biological systems. So when Jerry wants to hold on to this really outdated idea that quantum entanglement only matters at the sub-atomic level and has only been demonstrated there, that’s just easily provably false. The other area that I really feel the need to push back on in this interview is the whole Wallace versus Darwin debate. Now, going into this interview it wasn’t a centerpiece for me to talk about but as you heard, it really became a topic that we talked quite a bit about. I was surprised by Jerry’s answers because they directly contradicted, as I read into the show, the work of Professor Michael Flannery who I thought had a pretty good grasp on the history here. So one of the things I am going to do is have a follow-up conversation with Mike Flannery and really, I hope, get to the bottom of resolving that because that is resolvable. I mean, it’s history; did this guy publish on this date? What do other people say about his publication? I think Jerry is just flat-out wrong about that but I’ll wait a little bit and see what Professor Flannery has to say. I expect and I hope that this interview will generate a lot of dialogue among you Skeptiko listeners and I hope to hear from you about that. So please join me on the Skeptiko forum or in the Comment section of the show and tell me what you think. You can find both of those through the Skeptiko website, which is at skeptiko.com. You’ll also find there links to all our previous shows and an email and Facebook link to me and bunch of other good stuff. So that’s going to do it for today. Stay with me. I have a number of interesting interviews coming up. As I mentioned previously, I’m going to bring those at a weekly publishing schedule for a while just so I can get caught up and then we’ll be back to every other week. Thanks for being with me; thanks for joining me. Take care and bye for now.